If you’ve been inside a nursery any time recently, or spent any time on Pinterest, you’ve probably seen some version of a miniature garden. Mini gardens are a whole cottage industry now, with classes and clubs and a cult like following. (In a good way!) 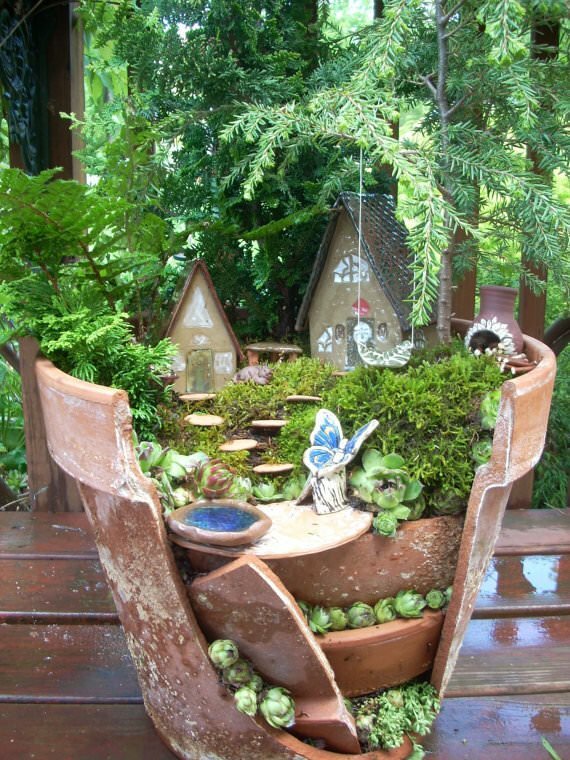 Fairy gardens are closely related, and are simply miniature gardens tended by mythical fairy creatures. Makes perfect sense, right? I totally get the need for some garden fantasy, but I personally lean less towards the fairy and the cute kind of gardens, and more towards the mini versions of what I dream about for my big garden! 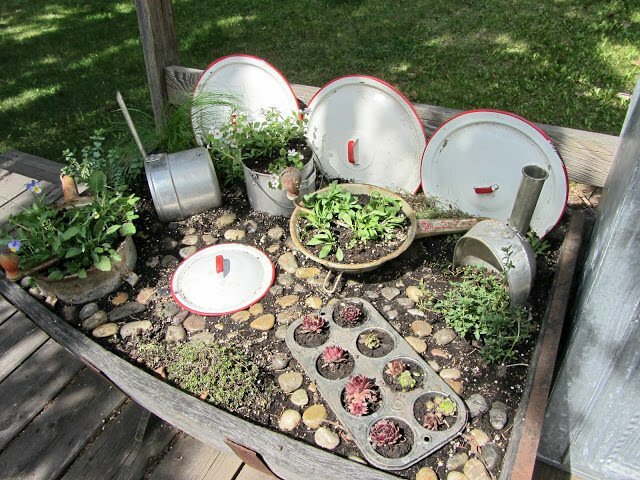 I’ve had this idea for a miniature garden for while now, and I plan to get to it soon, even already have the copper container…and when I do, I will share it with you all, but in the meantime, I wanted to show you what some other great bloggers have done, and how they did it so you can get hooked as well! DIY miniature gardens, with tutorials, ideas and resources! Our feature project, above, is a miniature garden with patio from much admired Garden Therapy. Stephanie has a complete tutorial at her site, including instructions on making a permanent patio and resources on where to find supplies. From Pollyanna Reinvents, I love this one. 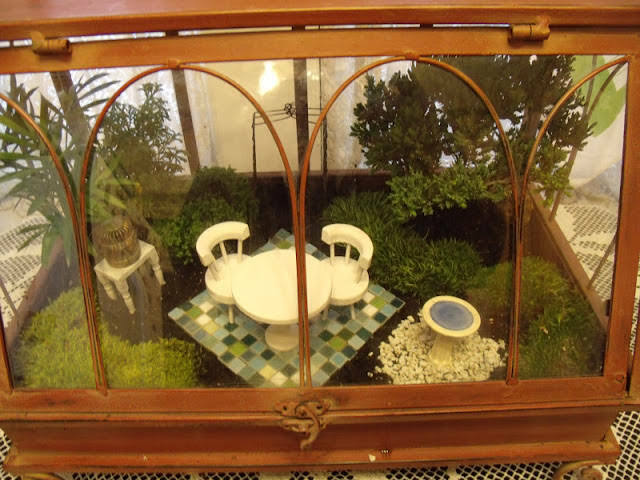 Its a tabletop mini garden terrarium complete with a bucolic scene, and is perfect for chasing away winter blues indoors. Click through to find her step by step! The Knitted Garden has created this inspiring miniature fairy garden, right in the base of a tree. I think this just epitomizes the magic of a garden. 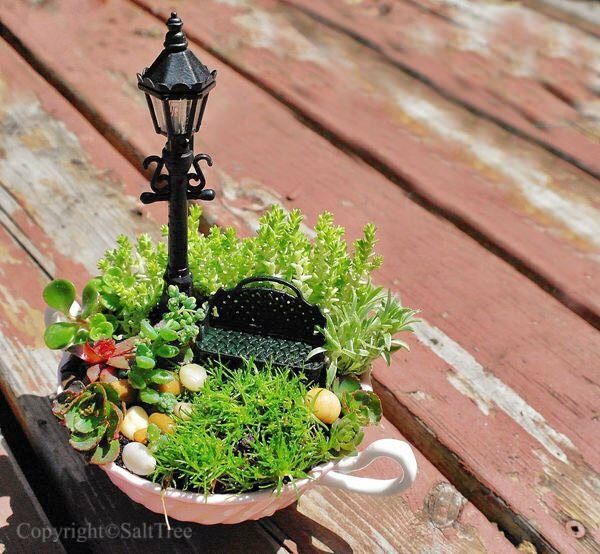 Find out how to make this tabletop tray garden from BHG… This is a great miniature garden for indoors! 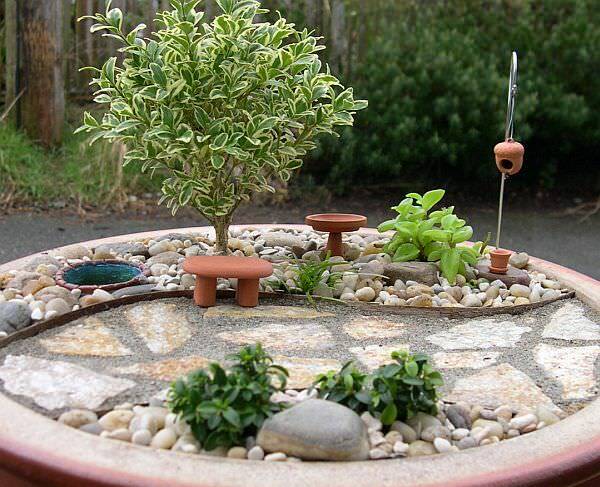 This miniature garden from Minimalisti would be created with the same patio instructions as the ones from Garden Therapy in the first project…great inspiration though! Organized Clutter Queen has a different take, with this kitchen miniature garden. Love her use of what she had and creating something great from nothing! 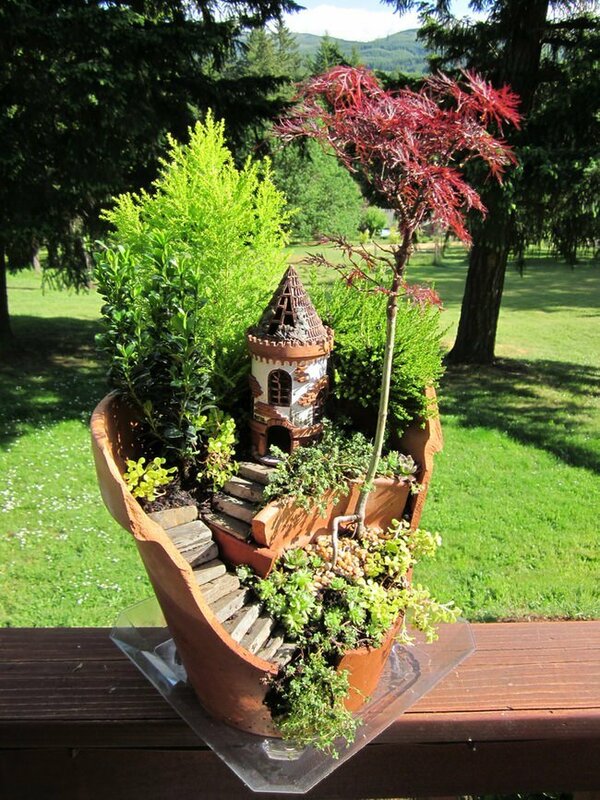 Unfortunately I don’t have a step by step for this broken pot mini garden, it was created by Pinterest user Sue Matyszak. Plenty of inspiration here! You can find a step by step for broken pot mini gardens at The Garden Diaries. 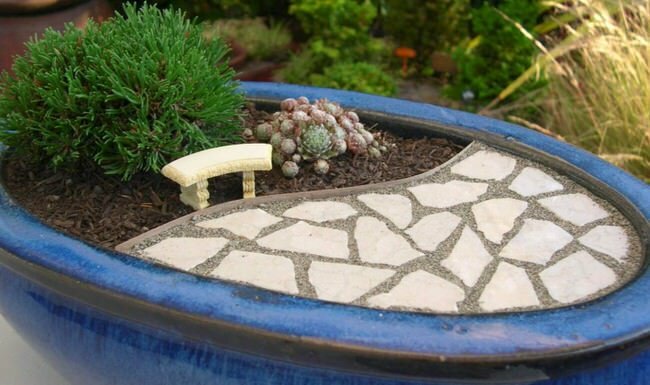 If you want to go an easier route, you can order this fairy garden broken planter kit from Laughing Orange Studio. Love this! 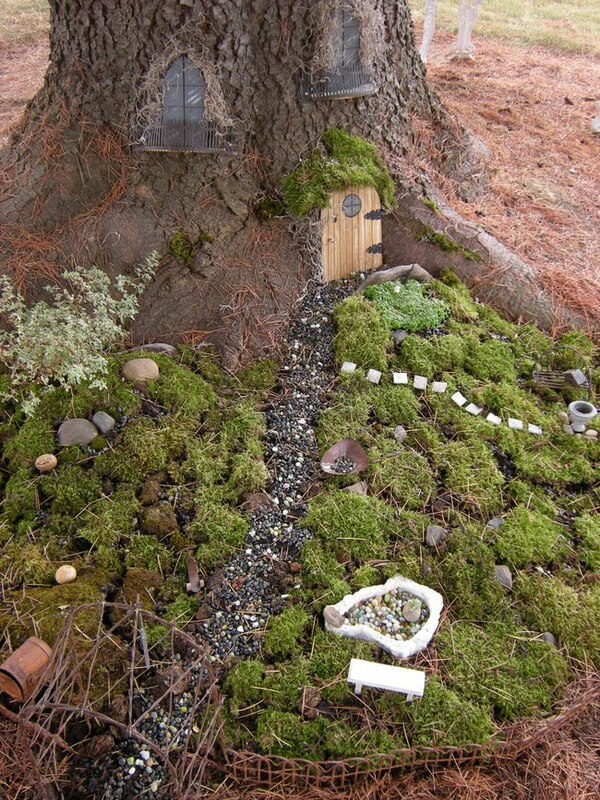 Another inspirational fairy garden built into a tree by artist Sally Smith… If you are interested in this type of miniature garden, visit her site and find out all about her and her resources! Lastly, we have this tiny little miniature Teacup Garden, from Salt Tree. This is such a cute idea! What a nice gift this would make!